The temple is piously praised in the hymns of celebrated Vaishnavite Saints Periazhwar, Tirumazhisai Azhwar, Bhoothathazhwar and Peyazhwar as a place where nightingales are heard singing the glory of Lord Perumal. 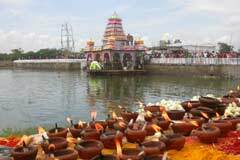 Masi Float festival in February-March; Vaikunda Ekadasi in December-January and Purattasi Navarathri in September-October are the festivals celebrated in the temple. The place and temple occupy a great place of importance in the history of Vaishnavism. 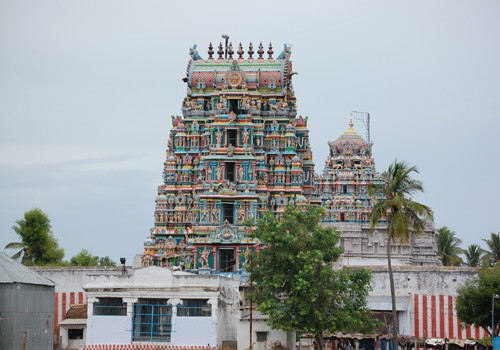 Being one among the celebrated 108 Divya Desas of Lord Vishnu, the temple has the famous Astanga Vimana above the presiding Perumal. Just a couple of Vishnu temples have this Vimana. This is also a historical place from where great Vaishnavite Acharya the author of Visishtadvaita philosophy and social reformer Sri Ramanuja preached the holy Narayana Mantra to every one irrespective of caste discrimination sitting on this Vimana. Sri Soumyanarayana Perumal Temple, Tirukoshtiyur-630 211. Sivaganga district. Lord Narasimha graces from the north side of Ashtanga Vimana. It is a different feature here that planets Rahu and Ketu are nearby to Him. Lord Narasimha also has His shrine in the prakara killing demon Hiranya. There is also a Swayambu Linga at the entrance of the temple. This is one of the temples where devotees seek relief from delays in marriage proposals. They also pray for prosperity in family. Devotees light ghee lamps expressing their gratitude to Lord. Besides consorts Mothers Sridevi and Bhoodevi, Lord Soumya Nayaraya Perumal graces the devotees with Madhu, Kaidaba, Indira, emperor Pururuva, Kadhamba Maharshi, Lord Brahmma, Mothers Saraswathi and Savithri. Lord Santhanakrishna (Perumal who grants child boon) is in a cradle. He is also praised as Prarthana Kannan. Those seeking child boon pray here lighting lamps. Indira was staying in this place till Lord killed Hiranya, gave the Soumya Narayana Vigraha to Kadhamba Maharshi. He was worshipping Perumal in his Indraloka earlier. This Vigraha-idol is the procession deity of this temple. In his Mangalasasanam, Periazhwar had included this procession Perumal too. 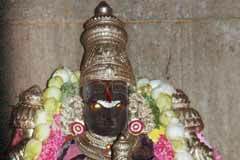 The place and temple has the reputation of Mangalasasanam of five Azhwars, Periazhwar, Thirmangai Azhwar, Thirumazhisai Azhwar, Boothathazhwar and Payazhwar. It is noteworthy that divine sculptor Vishwakarma and demon sculptor Mayan had jointly worked in the design and construction of the Ashtanga Vimana. The Vimana has three petals representing the three syllables Ohm, Namo, Narayanaya. 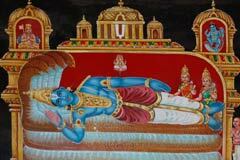 Perumal blesses the devotees in four forms from the Vimana – as Nardana Krishna (Bhooloka Perumal) from the base petal, as Soumya Narayana Perumal (Tiruparkadal-Milk Ocean-Perumal) from the first tier in reclining form, as Upendra Narayana (Devaloka Perumal) in the second tier, as Paramapada Nathar (Vaikunda Perumal) in a sitting form in the third tier. 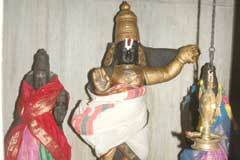 Mother Tiru Mamagal has Her own shrine, also praised as Nila Mamagal and Kulama Magal. Prayer with lamp is an important prayer here. Devotees buy a lamp, place it at the feet of Lord, take it back home, place a coin and Tulsi leaf, keep it in a box and cover it. 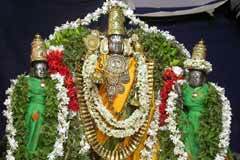 They believe that Lord and Mother had come to their home in the form of Tulsi and coin. Realizing their wishes, they take this lamp along with another one lit with ghee on the Masi (February-March) float festival day for worship. New devotees coming there take this lamp for their worship. Mahamaga well: While Emperor Pururupa was carrying out renovation of this temple, the great Mahamaga festival of Kumbakonam also coincided. The emperor wished to have Perumal darshan in this place. Responding to his prayer, Holy Ganga sprang up in the well at the northeast side and Perumal gave darshan to the emperor from this well. The well is thus named Mahamaga Kinaru. Well-Kinaru in Tamil. This festival occurs once in 12 years when Lord grants darshan sitting on His Garuda Vahan. 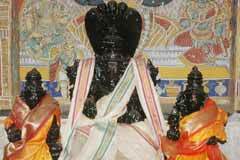 Teaching to Sri Ramanuja: Tirukoshtiyur Nambi living in Tirukoshtiyur was a great scholar in scriptures. 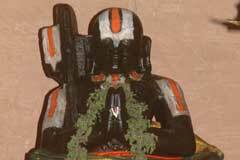 Sri Ramanuja approached him for initiation in Mantras. He called Nambi standing outside. Nambi asked who the caller was. Ramanuja said “ I am Ramanujan. (I in English means Naan in Tamil, an expression of disobedience or arrogance in spiritual terms) Nambi simply asked Ramanuja to go back and return after the death of Naan. Sri Ramanuja did not understand what Nambi meant. Yet, he came to Nambi 17 times and returned back with the same answer. When Ramanuja came finally, he told Nambi that ‘Adiyen (meaning the humble disciple) has come. Nambi called Ramanuja and taught the Mantra ‘Ohm Namo Narayanaya’ on condition that this should not be disclosed to anybody and if he violated the condition, he (Ramanuja) would be pushed into the hell. Fuelled by the boon obtained from Lord Brahmma and the arrogance grown then, Hiranya began to harass the Devas. 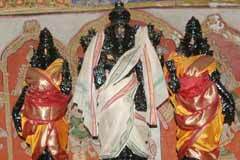 They sought protection from Lord Vishnu. Lord called them for a discussion to decide on the action against Hirayna. The sages, still afraid of the demon, told the Lord that the venue of the discussion should be such not known to Hiranya, which Lord approved. Meantime, Kadhamba Maharshi was performing penance here on Lord Perumal. He had a boon that there should be no disturbance in the place of his penance. So this place-Tirukoshtiyur was chosen for discussion. Lord said that He would take Narsimha Avatar to destroy Hiranya. Pleased with the decision, Devas and sages begged the Lord to grant them the darshan of his forthcoming Avatar. Lord was too merciful to grant them the darshan even before it took place. Yet, not contended with this darshan, Devas and sages begged the Lord to grant them darshan of His other forms too. Lord granted His reclining, sitting, standing and walking forms. As the Tirukkai (harships) of Devas and Rishis were solved in this place, it came to be known as Tirukkottiyur. Tiruputhur is 62 km from Madurai. 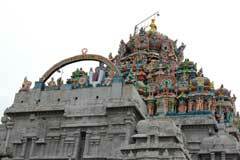 The temple is 8 km more from Tiruputhur. Buses are available only at specific hours.